I kept my promise today and delivered them to Martin Luther in person. I could not mail them to the door because the old wooden door has burned. The new doors are made of bronze and there’s a barrier to keep me from getting within 10 feet of the current doors. The original doors were like the town bulletin board. Everyone posted things on that door. So in a way it was nothing unusual. Here is a short two minute video. The Vatican will issue a stamp to honor Martin Luther this year, marking the 500th anniversary of the Protestant Reformation. The Vatican regularly issues stamps to mark special occasions and to honor individuals. In the past, stamps have been issued to honor non-Catholics, but never to honor a non-Catholic for religious leadership. 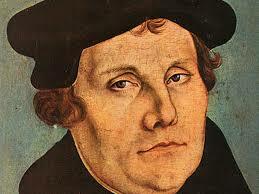 “Luther was condemned as a heretic by Pope Leo X, and called “a drunken German who will change his mind when sober”. He carefully researched Luther’s statements, and declared that he must recant 41 of these statements or face excommunication. This was done with a Papal Bull, or an edict, called ‘Exsurge Domine’. In the ‘Decet Romanum Pontificem‘ on January 3, 1521, Luther was officially excommunicated” (Wikipedia). 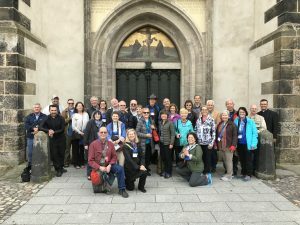 Thirty-three of us now have a front row seat to really learn about Martin Luther, in Germany to study the Reformation (Rebellion) on location as we argue with Luther in all the significant places in his life as the historical event unfolded. For more info on the Vatican’s Martin Luther stamp, click here.